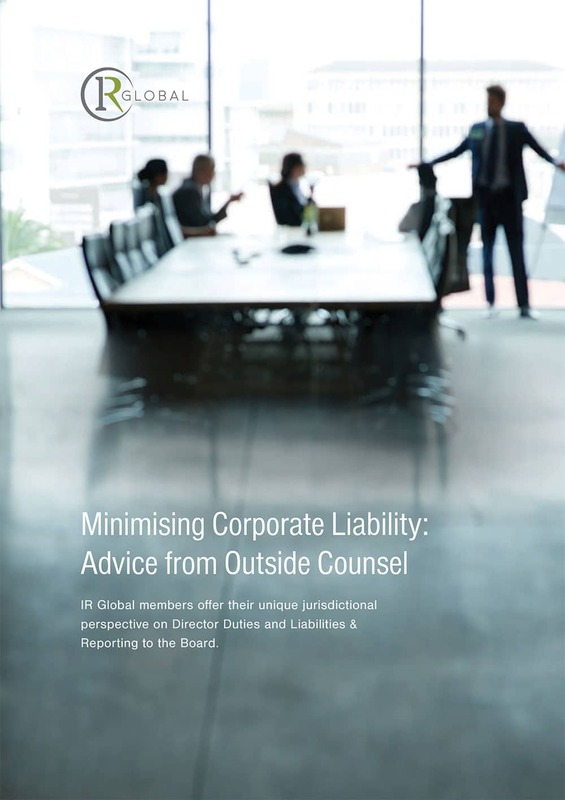 Jian Zhang was featured in a report titled “Minimising Corporate Liability: Advice from Outside Counsel”, published by IR Global. In the report, IR Global members offer their unique jurisdictional perspective on Director Duties and Liabilities & Reporting to the Board. Top three things to consider in China with regard to director liabilities/reporting to the board? Perspective: Successful governance transcends just mechanical and administrative relationships among shareholders, directors and officers; it is part of a series of systems, procedures and programs designed to protect the company and all aspects of its business in an increasingly challenging and deteriorating business ecosystem. Layered Systems: The General Counsel, together with all chief executive officers (CXOs), directors and officers must actively protect the business (key personnel, hard/soft assets, trade/business secrets, know-how and IP, supply chain (procurement and sales) and the integrity and reputation of the company). Failing to implement China-specific layered governance and anti-corruption systems generates scandals, plus huge monetary and reputational damage. How does your firm work with General Counsel in making sure the board fulfils its duty to monitor—not only in terms of addressing director liability problems as they emerge, but also in proactively minimising the risk of future events? We support General Counsel to establish China-specific layered governance and anti-corruption systems, designed to protect all aspects of their business. We do not rely on kneejerk mechanical applications of foreign approaches, unlikely to translate well in China. We work with the General Counsels to create a balance between global and China best practices, based on actual market realities. At the most basic level, we create fixed fee secretarial services systems to meet all applicable annual/periodic company law and other regulatory governance and reporting requirements. In addition, we work with the General Counsels and other CXOs to plan, design and implement governance and anti-corruption educational/training programs tailored specifically for particular CXO audiences (e.g. leadership, management, procurement, sales/ distribution, vendor/supply chain, government relations/regulatory approval). We also implement programs targeted at collective SBU audiences since the impact of many real life situations are not compartmentalised by title. We conduct programs on commercial bribery in the People’s Republic of China (PRC), covering key elements and penalties, active compliance and forms of bribery. The program also summarises relevant PRC laws including liability for corruption and the implications of offering/accepting commercial bribes. We explain how to mitigate corruption risks through compliance programs and active risk management and articulate the difference between official and commercial corruption. Passive old world static templates and models are not built for today’s China. The market challenges are changing radically and rapidly and the General Counsel and CXO team must adapt to specific threats. Each company must tailor its plan. China is home to many disruptive exponential growth companies and industries which are applying real time Big Data, C2B (Consumer to Business) models and cashless e-wallet transactions. Data and privacy protection are threatened by the government, the military, industrial espionage and professional hackers. The complexity of the challenges facing the General Counsel and CXOs cannot be simplistically labelled and require a coordinated ecosystem of professionals to navigate them successfully. Winning complex trade secrets theft cases does not fall to selecting any legal team. Protecting a China-based business, much like a football game, now needs more than just a good quarterback or striker; it takes a team. The relevant applicable laws vary, based on each company’s industry, operational needs and location (since national and local laws apply). A specific company approach needs to be tailored to protect in each case. Many laws may apply, including company law, criminal code, EHS, customs, tax, securities and various administrative laws relating to food hygiene, chemical, waste handling, medical safety, storage and licensing. Navigating the right laws is required to safely address the question of director and officer liability risks and best practices. Examples include tax evasion and violation of food safety rules. Administrative laws set out a company’s responsibilities which are enforced by civil penalties. If the violation is serious, the case may be escalated and the person in charge could be criminally charged. Law enforcement authorities have significant discretion in assessing whether to bring criminal charges against an individual. In many prominent food and pharmaceutical safety cases, imprisonment and death penalties have been applied. China is trending toward greater enforcement of its laws, with ignorance and neglect not considered to be effective defences. Regulatory scrutiny will increase and companies who fail to comply, or do not have systems in place, will be at greater risk in the coming years. As indigenous competition grows and informational leakage continues to be a threat, lackadaisical companies, especially foreign businesses, may experience increasing legal exposure for lapses in focus. Many international companies have fallen victim to their own neglect and tardiness in implementing systems and programs fit for a constantly and rapidly evolving ecosystem. The passive western ‘business as usual’ approach will become more dangerous in the coming years.